With a double redundancy payment to fund their boat, Mike and Mags are enjoying their life in the slow lane. They cruise for the nine months of more pleasant English weather before escaping the ice and snow for a few winter months abroad. Come on Mike, you’re missing out on one of the great pleasures of living on board; sitting in front of a roaring stove while the weather does its worst outside! We are Mike n Mags (Poppy and Abbey two Wire Haired Fox Terriers) We are described on our blog as “Mike – a grumpy old curmudgeon who hates to see our wildlife and countryside destroyed. Maggie – a strong willed and feisty biker. Poppy and Abbey – two strong willed and even more feisty Wire Haired Fox Terriers.” We both own and enjoy riding motorcycles. I am a radio ham and into genealogy, photography, writing, surfing the web and Mags is into dancing and knitting. We have not found a way to combine our interest at the moment! We did not intend to live our lives afloat, but we have a history of holiday hire boats over a number of years. 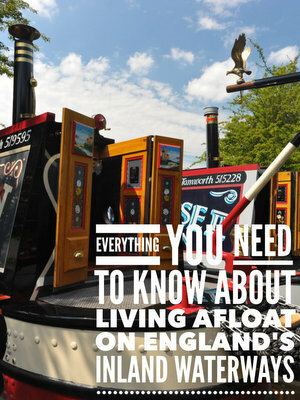 We decided to own rather than hire so that we could spend more time afloat at the weekend and during holiday periods. So we entered a protracted search for our boat. We did consider a new build, but with all the boat builders going out of business and the horror stories that were in the press. We change tactic to looking for a best compromise and second hand. When we found our ideal boat we were also fast approaching retirement. It was at this time that we sort of evolved to spending more time afloat than ashore. We both worked in higher education (52 years between us) and our employer was looking to up-size the number of students and at the same time down-size the number of staff. With a little over a year to go to our expected retirement we were made and offer of voluntary redundancy. (Brokered in a “walking up in bed with a horses head” sort of way) After we had removed the smiles off our faces (With a paper scraper) we planned to start spending more time afloat sooner rather than later. I now have difficulty in remembering anything from the last five years of University life – I must be in denial. Rose of Arden (Rosie to us) was a name chosen by her previous owners. She was named Rose and as she was built in Henley in Arden that’s where the suffix came from. We had considered calling our boat Wits End II as our home is called Wits End. However as Norman Vaughan used to say “Roses grow on you!” so has the name. 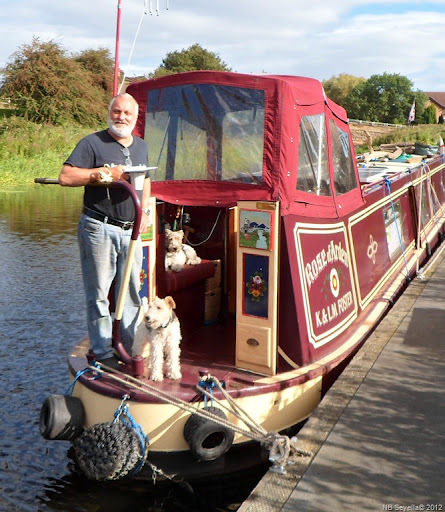 We have a permanent BW leisure mooring on the South Yorkshire Navigation where the boat is stored between trips out. We are considering saving money and looking for a winter mooring as an alternative. Do I sound like a budding Constant Cruiser? Rosie is 50′ in length narrow in beam and is a semi trad design. With pram and cratch covers. Reverse layout, with (from the bow) bedroom, bathroom, kitchen and saloon. Pump-out, Beta 38 engine, Aldi gas central heating, Villager puffin stove, Gas oven and hob. Bath and Shower plus hand basin and maceration toilet. Three years in total. In that time we have covered Miles: 1285.5, Locks: 866, Swing / Lift Bridges: 161, Tunnels. 22, Pump Outs: 14, Engine Hours: 2455.0 give or take an inch! Our employer purchased this for us in a round-about way with a double bubble redundancy payment. With the surplus we purchase a second property which we rent out! This year will be about 9 months. We also like to travel abroad. Early next year we will be in India for a month or so! The speed which now matches our lifestyle. Nicholsons guides and a TomTom sat nav. The bus pass sometimes comes in useful. Mags has a granny trolley in a tasteful pink colour – this means that macho me is unable to be seen in public with said item! e have a Zanussi washing machine on the boat. We use cruising clubs and BW moorings with electrical bollards to obtain the mains. As and when needed or when the Lynx effect wears off! Pump out – I tried a cassette once…. just the once… we keep it for emergency needs in the garage at home! We have not had another emergency aboard since! Dongle from T-Mobile. When the contract finishes next month we will go MiFi. I am happy with the service and support from T-Mobile/Orange/EE. Get a dongle with an external antenna connection. Coverage is greatly improved. The Shroppie and the Leeds Liverpool around Skipton. Least favourite section is after Littleborough going towards Manchester on the Rochdale canal. olar panels and engine alternators. 500 Ah battery bank Victron inverter, Sterling A to B controller. It depends on where I set the thermostat. In the main we are very snug and warm. We work on the principal that if you are warm you are happy. If you are unhappy – have a beer and turn up the thermostat or throw another log on the stove.. Try before you buy, hire in winter if you are going to live aboard all the year round. If you think that living aboard it a cheap form of accommodation – think again. Bricks and mortar appreciate in value – boats depreciate. You can read Mike’s very detailed blog here.